Our company supplies all your packaging needs! 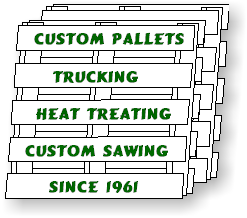 We furnish wood pallets to meet all your current requirements, corrugated cartons, industrial lumber, and boxes. We have been in business since 1961 and are committed to customer satisfaction. Our company is located in Sandusky, MI. We are available on a daily basis with reliable on time delivery to meet our customers production schedules. This commitment eliminates the possibility of production interruptions and costly down time. We are dedicated to the manufacturing of quality controlled products that are both versatile and flexible to meet a wide range of customer needs. Our company offers quality and service at competitve prices. We would like to include you in our list of satisfied customers. An opportunity to quote on your current pallet and packaging needs would be appreciated.